Each year, Lyon is welcoming around 16 000 international students! But International mobility also covers a lot of various programs such as international social service or European Voluntary Service. 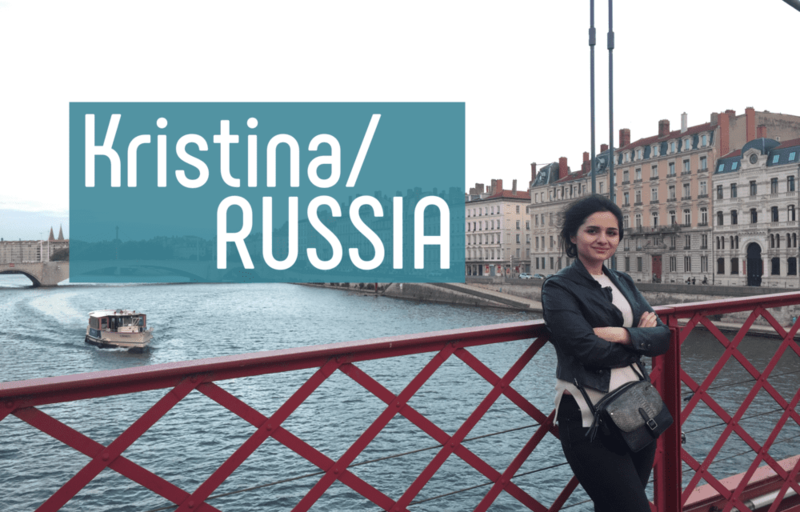 Let’s talk with Kristina and Marta, currently having a great abroad experience in Lyon within such programs. When have you been in Lyon and how long? I came to Lyon from Russia on the 07th of October 2018. Why did you come to Lyon? I came here to do my European Voluntary Service. It is not my first time in France, I visited several cities but I always wanted to go to Lyon because I heard a lot about this city and it was my goal since several years, so here I am! What was your first impression when you arrived? When I arrived in Lyon, I was impressed by all the things I was seeing: nice people, architecture, lot of traffic, a big city as I love it! All the cities I ‘ve been visiting in France was pretty small and now in Lyon, I am very happy to have so much opportunities and things to do. I am never bored. I love Lyon so much that I want to go on with studying my Master degree here. I will do my best to stay at least two more years in Lyon. My favorite place is the old town. The atmosphere there is wonderful and always makes me forget all worries. Did you travel in the region? If so, what did you especially like or discover? I didn’t travel a lot in the region yet. I just went to Grenoble in August before reaching Lyon. I did my internship there. My first visit to France was last year to follow an internship in Nancy, it was a good opportunity to travel a bit in France. This year, I hope discovering French regions and have a better knowledge of the culture. Did you speak French before your experience in France? Yes, I learnt French at university in Russia, thanks to my internships I could practice the language and I really hope that my stay in Lyon for 9 months will help me cancel my language borders. What was the first or favorite French word you learnt in Lyon ? The first word I learnt was “praliné”. Everywhere in bakeries windows I saw the praline pies. When I tasted it, this word got stuck in my head, you can’t forget the word and the taste! How will your experience be useful for your future? The European Voluntary Service is a rich experience for me at first for my French skills, and to learn more about the culture and French way of life. Then, I already know in which French city I would like to go on with my studies, it is Lyon of course. I already met people learning in the study field I would like to follow next year, so it is cool to contact them to have a good preparation for my next university year. I arrived in Lyon two months ago, but it seems like yesterday…Time goes by quickly here! After finishing my bachelor in sociology and international relations, I wasn’t sure about my next step regarding my professional life. I always dreamt about having one year off and go for a volunteer program, and there I am! I found a project in Lyon which was really interesting to me: a 12 months social service mission to be responsible of external communication, associative life, and project assistant at Concordia. This association organizes projects in the international mobility field. I directly applied because it was my dream job, but it was also a single opportunity to discover a new city and improve my French skills. How big is this city! I come from Grande Canarie, a tiny Spanish island, and I had never lived in a big city. When I arrived in Lyon and discovered that I could take the metro, the bus, tram or bike to move, I was really lost! Where should I take the transportation? Which stop? Which direction?! At first I was scared, but I quickly learnt how to deal with everything like a true Lyon inhabitant…And I am really proud of it! I love Lyon ! From all the cities I know in France, Lyon is probably the nicer to live. It has all the benefits of a big city without inconvenience of bigger cities like Paris…it is well balanced. There are so many little details which drove me to fall in love with this city: bakeries which give streets delicious aroma, the Rhône river with its never ending banks, the reflection of colorful buildings on the greenish Saône river, the Fourviere basilica enlightened at night and visible from all city corners…briefly, impossible not to love Lyon! Which point is especially to highlight? I don’t feel like a foreigner here, and I am so grateful to Lyon inhabitants for that! 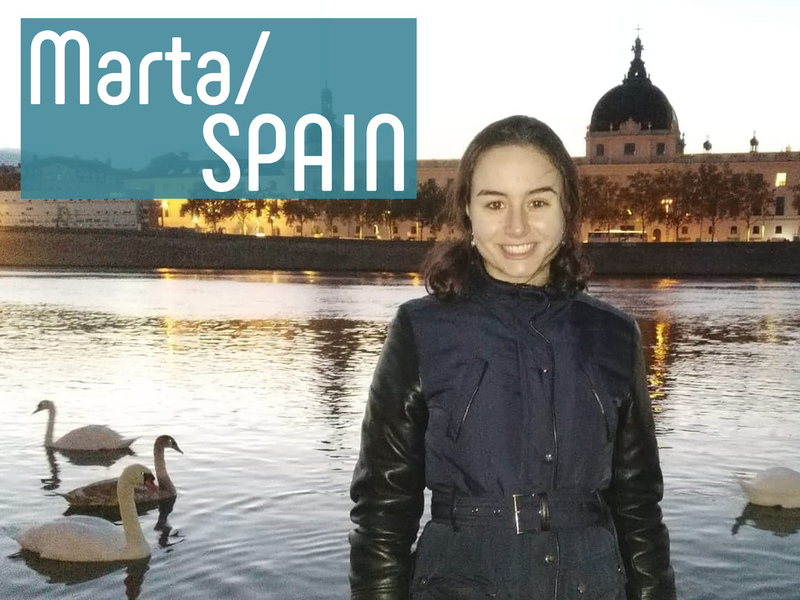 It is not a feeling that everybody can experience when leaving his/her own country, so I know that I have luck to live in such a welcoming and multicultural city. The old town, no doubts ! This district has a special charm : cobbled streets with a lot of small bars and traditional restaurants, historical treasures which stay hidden in the Traboules, ochre houses, ice cream shops with unique tastes, crepes and waffles sellers…To stroll in the old town is a whole gastronomic and architectural experience! In the Auvergne-Rhône Alpes region, I especially liked Pérouges, a small medieval town in the near of Lyon. I was surprised to know that lot of young people from Lyon never went there, it is too bad because it is a stunning place! Surrounded by nature, it is amazing how rythm of life there is so different than the one in Lyon, and there is just 40 kms in between both cities! Cobbled streets, stone houses, charming craftsperson shops, and bakeries selling sugar pies (a specialty from the town) by the window give the feeling of travelling through time to the middle age…a highly recommended visit! Fortunately, yes. I learnt French in high school, and I did an erasmus exchange in Lille during my bachelor degree. The fact of having skills my arrival made my integration in work and social life in Lyon easier. But I like to learn new words and expressions every day, and little by little, I feel more comfortable to take part in conversations with French people, which learn me a lot. I like the word « Gone ». One of my first days in Lyon, I noticed that several shops and restaurants included this word. As usual, I got my phone to check an online translator but I didn’t find anything, surprisingly! Fortunately, some days after I spent there again with my French flatmate who knows Lyon very well. He explained me the meaning of “Gone”: a child from Lyon. Very special! Is there any anecdote, connected to your experience that you wish to tell? During my stay in Lyon, I noticed how much French people are proud of their culinary specialties. It is so funny to see how people are disturbed if one don’t like wine (it is my case!) or if we don’t slice cheese in the right way. One time, I organized a crepe party to gather other volunteers and colleagues. I started to bake crepes but I couldnt make them round and beautiful. But a French volunteer (who likes cooking!) took the pan. He taught me how to design a nice crepe batter which is much more liquid than I thought. When he started to serve perfect crepes, I directly understood that I didn’t know how to make it before this amazing lesson. I look forward coming back to Spain and boast about my new crepe maker skills…Thank you, master! An abroad experience is always useful. Leaving the comfort zone, adapt to new atmospheres, make new friends, speak another language and start again in a city we don’t know, it is never easy of course. But it is so enriching! I feel myself growing every day, I am more and more confident, and I think that if I could adapt myself so quickly to a different reality than the one I used to know, it means that I can do anything I want. And to me, adaptability is one of the most important skill to be happy, in personal and professional life. So I invite all of you to pack and start your own adventure! If you want any details about those interviews, or seek for any additionnal info, I would be delighted to answer via mail or on Whats App !